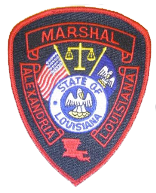 Welcome to the Alexandria City Marshal's Office Website. This site is designed to explain the duties and responsibilities of the office and introduce you to the new City Marshal, Jerome Hopewell, and staff. There are also links that allow you to pay traffic citations and inform you of the procedures for using the Alexandria City Court and Alexandria City Marshal’s Office. If you have questions or comments, you may use the “Contact Us” link or call our office between the hours of 8:00 A.M. and 4:00 P.M. Monday-Friday.